The development and application of quantum mechanics (QM) methodologies in computer- aided drug design have flourished in the last 10 years. Despite the natural advantage of QM methods to predict binding affinities with a higher level of theory than those methods based on molecular mechanics (MM), there are only a few examples where diverse sets of protein-ligand targets have been evaluated simultaneously. In this work, we review recent advances in QM docking and scoring for those cases in which a systematic analysis has been performed. In addition, we introduce and validate a simplified QM/MM expression to compute protein-ligand binding energies. Overall, QMbased scoring functions are generally better to predict ligand affinities than those based on classical mechanics. However, the agreement between experimental activities and calculated binding energies is highly dependent on the specific chemical series considered. The advantage of more accurate QM methods is evident in cases where charge transfer and polarization effects are important, for example when metals are involved in the binding process or when dispersion forces play a significant role as in the case of hydrophobic or stacking interactions. 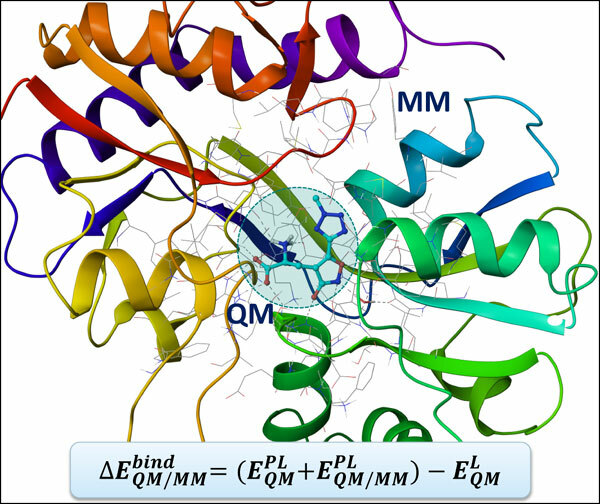 Keywords: Quantum mechanics, Hybrid QM/MM methodologies, QM-based protein-ligand binding energies, QM-based docking calculations, QM/MM scoring functions, Systematic assessment of protein-ligand affinities. Keywords:Quantum mechanics, Hybrid QM/MM methodologies, QM-based protein-ligand binding energies, QM-based docking calculations, QM/MM scoring functions, Systematic assessment of protein-ligand affinities. Abstract:The development and application of quantum mechanics (QM) methodologies in computer- aided drug design have flourished in the last 10 years. Despite the natural advantage of QM methods to predict binding affinities with a higher level of theory than those methods based on molecular mechanics (MM), there are only a few examples where diverse sets of protein-ligand targets have been evaluated simultaneously. In this work, we review recent advances in QM docking and scoring for those cases in which a systematic analysis has been performed. In addition, we introduce and validate a simplified QM/MM expression to compute protein-ligand binding energies. Overall, QMbased scoring functions are generally better to predict ligand affinities than those based on classical mechanics. However, the agreement between experimental activities and calculated binding energies is highly dependent on the specific chemical series considered. The advantage of more accurate QM methods is evident in cases where charge transfer and polarization effects are important, for example when metals are involved in the binding process or when dispersion forces play a significant role as in the case of hydrophobic or stacking interactions.